NSW DPI and Local Land Services is leading the response to yellow crazy ant in the Lismore region first discovered in May 2018. 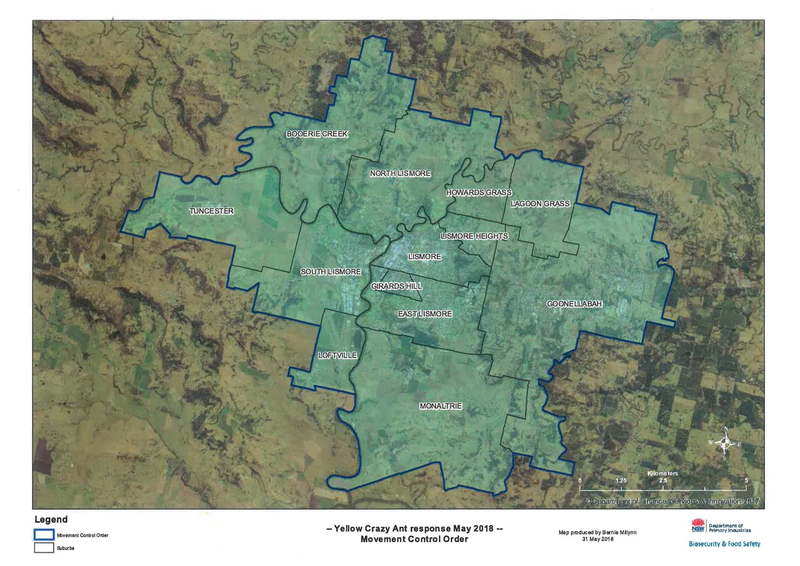 The infestation is restricted to two sites; the Lismore CBD and Terania Creek North of Lismore. Yellow crazy ants are highly invasive and can build super colonies and devastate local flora and fauna and impact on agricultural production and the horticultural industry. Yellow crazy ants, although not a direct threat to humans, are serious and classified as a prohibited matter event under the Biosecurity Act 2015 as they are a serious environmental pest which pose a risk to our economy, environment and communities. The provisions of the Act include a duty to notify NSW DPI if you become aware of, or suspect the presence of yellow crazy ants. Extensive surveillance has been conducted in the local area and the two known infestations continue to receive ongoing treatment. The treatment program which is subject to strict conditions to ensure there is no “off target” damage has been progressing well with a clear reduction in the number and vigour of nests at both the CBD and Terania Creek infestations. It is expected that treatment will continue throughout the coming months. The response team has put a lot of effort into locating specific nests within the CBD infestation and has trained a odour detection dog to accurately locate any additional nests. In February this year, further community surveillance operations in the broader region using government and community representatives was conducted to determine the presence of any outlying infestations and ensure no further sites were present. We are working hard to stop the spread and eradicate Yellow Crazy Ant in NSW and we need your help. Remember - the sooner we know about an infestation, the sooner we are able to put in place measures to contain and eradicate yellow crazy ant. To help us prevent the spread of yellow crazy ant, NSW DPI has put movement restrictions in place, preventing the carrying of vegetative matter and soil within a 5km radius of the Lismore CBD. For more information, please refer to the General Biosecurity Direction (GBD). Individual or General Biosecurity Directions are being given to infested properties. Any movement of yellow crazy ant material off these properties require a permit. People within the 5km area (other than infested properties) are now only required to satisfy an online risk assessment by submitting a risk assessment and notification declaration form to move yellow crazy ant materials. High risk businesses within the 5km area, or businesses identified by NSW DPI as high risk will require a Biosecurity Permit to move yellow crazy ant material. Yellow crazy ant materials moved directly to the Lismore Recycling & Recovery Centre 313 Wyrallah Road East Lismore NSW 2480 are exempt from the above requirements. Penalties apply to people breaking these restrictions. These provisions will remain in place until 30 June 2019. Following the movement control rules. Check your belongings before you leave the movement control zone and make sure you aren’t carrying an unwanted hitch-hiker. Regularly inspect your property for any sign of ants or nests and report any suspicious sightings immediately. Do not disturb the ants or nests or try to treat the infestation yourself as the ants will likely move location. Report nil sightings: Tell us if you don’t find any yellow crazy ants - that way we know the areas that have been checked. Report suspicious sightings immediately: Tell us if you suspect the presence of yellow crazy ant, even if you are unsure or think we may already know about the infestation. Follow the requirements of our biosecurity controls outlined in the General Biosecurity Direction. This means not moving certain things such as vegetation, plant matter or soil except in accordance with strict rules outlined in the GBD. Yellow Crazy Ant is recognised by their pale yellow body colour, unusually long legs and antennae. The name 'crazy ant’ is derived from their frantic movements and frequent changes in direction, especially when disturbed. Yellow Crazy Ants form super colonies with several queens and once a super colony is established, it can expand rapidly, in some cases doubling in size in 12 months. In order to effectively eradicate the ant, NSW DPI and its partners have applied bait in and around the Lismore CBD to directly treat known nests. Care has been taken to ensure safe application of the baits and treatments. Educating the community to check for and report suspicious ants. Avoiding the further spread (eg. by moving soil) is essential. In order to effectively eradicate the ant, NSW DPI and its partners applied bait in and around the Lismore CBD and directly treated known nests and immediate area around the nest. Care was taken to ensure best practice application of the baits, following conditions approved by the Australian Pesticides and Veterinary Medicines Authority. Expert advice was also sought from Biosecurity Queensland who have extensive experience in applying ant baits. The best method for destroying YCA colonies is by using the broad-spectrum Granular insecticide, Fipronil. This is more commonly used on ants including Yellow Crazy Ant. The team applying the baits generally targeted vegetated areas so the baits would not be washed away. Hard surfaced areas were avoided however the baits were applied to surfaces where there were cracks that contain ed the product and prevented it from being washed away. Fipronil is specifically designed to target invertebrate animals (animals without backbones) This product has been tested extensively and there is no evidence that Fipronil is harmful to humans. The application method used, and the low-strength formulation chosen, present very low risk to non-target species. Fipronil is not well absorbed by plants and is broken down by sunlight. As part of the permit conditions the baits were not be placed near waterways or storm water drains. 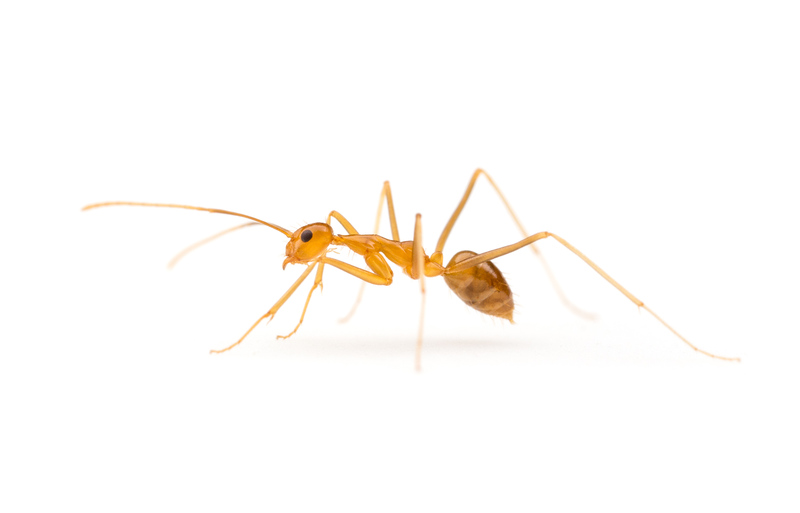 What are yellow crazy ants? The yellow crazy ant (Anoplolepis gracilipes) is a highly invasive exotic pest that can build super colonies and seriously impact local fauna, agricultural production and ecosystems. Unchecked, it poses a serious economic and environmental threat, so it is important that we prevent it taking hold in NSW. Yellow crazy ants were found at various sites in Lismore CBD in May 2018. Ongoing surveillance by the NSW Department of Primary Industries and Local Land Services has identified several smaller infestations in outlying areas which are currently being treated. The exact source of the infestation is speculative and we may never know how yellow crazy ant came to Lismore. Yellow crazy ant tends to walk rather than fly and are generally very slow in expanding their range by themselves. However, they can hitchhike in organic materials, or on people’s belongings, resulting in the infestation spreading. This is why it is critical for people to be aware and check for yellow crazy ant before moving equipment and materials. What do they do to local flora and fauna? When they achieve great enough numbers they are known to kill small animals. Although they do not sting, they squirt formic acid into the eyes of the prey which blinds the animal and they starve. The ants also tend to sap sucking insects which impact vegetation. This can change the composition of the vegetation in native forests. Inspection of properties in key areas upstream of Lismore and in flood deposition areas downstream of Lismore. A school surveillance and education program to enlist the help of students in the greater Lismore region. Regularly inspect your property for any sign of ants or nests. Report nil sightings. Tell us if you don’t find any yellow crazy ants - that way we know the areas that have been checked. Report suspicious sightings immediately even if you are unsure or think we may already know about the infestation. The ant nests are not obvious and are therefore hard to spot. As such, we do not have pictures of the ant nests but the best place to look for Yellow Crazy Ant is on the trunks of trees because they harvest sap sucking insects in the trees. Yellow to brownish ant with body about 5mm long. Abdomen is dark brown, sometimes striped. Legs and antennae are very long. Body is long and slender. A sample or photo of the ant will help with identification. Do the movement restrictions apply to me? Movement restrictions are in place, preventing the carrying of vegetative matter and soil within a 5km radius of the Lismore CBD. Individual or General Biosecurity Directions are being given to infested properties. Any movement of yellow crazy ant material off these properties requires a permit. People within the 5km area (other than infested properties) are now only required to satisfy an online risk assessment and submit a movement notification to move yellow crazy ant materials. High risk businesses within the 5km area, or businesses identified by NSW DPI as high risk will require a Biosecurity Permit to move yellow crazy ant material. Yellow crazy ant materials moved directly to the Lismore Recycling and Recovery Centre 313 Wyrallah Road East Lismore NSW 2480 are exempt from the above requirements. How do businesses continue to operate if they move restricted material? Does the restriction include food waste? No. The restrictions won’t include food waste. Mowers and mowing equipment should be cleaned before being moved outside the restricted zone. The grass clippings can be taken to the waste depot after being inspected for yellow crazy ant. Are bin and rubbish collections restricted? The Lismore Recycling and Recovery Centre will be exempted from the restrictions, and appropriate mitigation put in place on site following a risk assessment. Residents are encouraged to continue to use the centre as normal. Can I take mulch and other material into the zone? Yes. Garden materials, including mulch, plants, and other organic matter can be moved into the restricted zone. Can I undertake building works within the restricted zone? People within the restricted zone will be subject to movement restrictions covering soil, green waste and organic materials. However there will be a permit process in place to allow restricted movements of these materials when needed. This shouldn’t prevent construction certificates being issued. Can I park on grassed areas? It would help prevent the movement of ants if people did not park cars on grassed areas within the restricted zone. You may see Lismore Council officers or notifications giving direction on this issue. Can machinery and equipment be removed from the zone? Machines that move and shift soil or vegetation will need to be cleaned and free of material before being moved. I’m staying at the caravan park, am I affected? No. The restriction is not expected to impact the movement of vehicles or caravans, although we encourage you to check your vehicle and belongings before leaving the restricted zone. Will the restricted zone be changed at all? The restricted zone will be reassessed as required to take into account any newly discovered colonies. Surveillance activity is ongoing and we are encouraging people outside the restricted zone to report any suspected sightings of yellow crazy ant. Will community and sporting events continue? Community and sporting events are not affected and can continue as normal. Residents are reminded that ants can hitchhike on personal belongings and equipment so please inspect your gear before leaving the restricted zone. What do I do if I find ants on my belongings? Brush down your belongings and ensure they are free of ants before leaving the restricted zone.